Among the first moves of the new Maliki government has been an agreement with the Kurdistan regional authorities (KRG) to resume oil exports from fields in Kurdistan operated by foreign companies that have cut separate deals with the KRG previously. Exports are supposed to start as early as 1 February. So far, relatively few details about the agreed arrangements have been revealed. Baghdad has reportedly agreed to lower the minimum export requirement for Kurdistan in the annual budget to 100,000 barrels per day (it was originally 150,000 bpd, which the Kurds found somewhat steep), and unlike the previous attempt at starting export in the summer of 2009, Baghdad will this time pay a “contribution” (musahama) towards covering the expenses of the foreign companies that operate in Kurdistan. So far, the exact size of the payment has not been specified, but according to Asim Jihad of the Iraqi oil ministry it will be paid to the Kurdish regional authorities rather than directly to the foreign companies, and there are certain “barter” elements to the deal as well, including improvements to the refining capacity and electricity supply of Kurdistan plus provision of oil for the local market there. Thus in legal terms, it seems as if the stalemate regarding the contract status of the foreign companies is continuing as before. The Kurds are reluctant to formally submit the contracts to Baghdad for approval since that would mean not only potential challenges to the contract terms but also cession of what the Kurds believe is their sovereign right to conclude such deals with third parties. Baghdad, for its part, is reluctant to pay the companies that operate in Kurdistan directly according to the contract terms, since that would mean recognising the right of federal authorities to sign deals with foreign companies without coordinating with Baghdad – which in turn would mean that not only federal regions but in fact every governorate across Iraq could do the same thing. Since federal regions and governorates have exactly the same residual rights under article 115 of the constitution, it would be potentially suicidal for the central government to admit a residual power to sign contracts for so-called “future fields” without coordination with Baghdad. Under this kind of permissive scenario, Basra, Maysan and Anbar would suddenly negotiate with foreign companies without reference to Baghdad. It seems far more likely that Baghdad is aiming for a restrictive interpretation of article 112, second, that would require coordination with the oil ministry for all future deals as part of the national “strategic policy” on oil – and instead will opt for for temporary, horse-trading solutions of the kind now agreed with the Kurds in the short term while it is working on boosting its own export capacity, which will still take some years. Thus unlike what happened in 2009, money will this time be paid from Baghdad to Kurdistan, and presumably the Kurds will then pay the operating companies. The problem for the Kurds is that as long as the contracts are not submitted for review (as opposed to just making them public), Baghdad will continue to pay Arbil with reference to its own assessment of reasonable costs rather than in accordance with the lucrative terms of the contracts. Whether this in the long run is actually good enough for the Kurds – and not least their foreign partners – remains to be seen. Clearly, the foreign companies that operate in Kurdistan are not there in order to do non-profit work forever, and the Kurds will be under pressure to pay them more generously instead of simply compensating them for expenses. Other potential hitches regarding the new arrangements relate to parliamentary oversight: Presumably the compensation payments are to be specified in the annexes to the 2011 budget to be debated in February, and presumably the payments due to be transferred to the Kurdish ministry for natural resources as part of the deal will be subject to parliamentary debate in the Kurdish regional assembly as well, where the PUK and Gorran have a history of asking critical questions about the KDP-led oil policy. Nonetheless, this deal represents an interesting move for the new Maliki government, where a key question since December 2010 has been whether Maliki will lean more towards the Kurds or Iraqiyya in hammering out his policies. Based on the latest move by Maliki to attach the independent commissions to the government, one can start wondering whether he actually has a viable grand strategy at all. He can afford to alienate either the Kurds or Iraqiyya, but not both at the same time. This holds true for the oil sector as well. The batch of decisions by the federal supreme court released earlier this week contained another interesting item in addition to the refusal to rule in the parliament replacement debacle. In a lengthy ruling, and probably one of the more innovative pieces of jurisprudence ever produced by the court, it has decided that henceforth the “independent commissions” and in particular the Iraqi election commission (IHEC) are to be “attached” to the executive branch of the government. But through a lengthy argument and creative thinking, the court in its latest ruling manages to put this unambiguous provision to one side by arguing instead that the nature of the work of IHEC is of the “executive” kind and hence its subordination to the legislative branch of government contradicts the principle of separation of powers, which is also part of the constitution as a general principle! In other words, the court has detected an “error” in the 2005 constitution, and rules in favour of the government against a clause of the constitution itself. This is interesting firstly because it indicates the amount of pressure that must have been brought to bear on the court from the government. Secondly, it begs the question of why the court is not doing anything to explicitly address a far more glaring “error” in the constitution, i.e. the obvious contradiction between article 115 (which gives residual powers to both federal regions and governorates) and article 122 as well as the whole provincial powers law of 2008 (which subordinate the governorates to Baghdad in a more comprehensive way). In this question the court has increasingly ruled in favour of the central government although clause 115 on the residual powers of the governorates is arguably stronger. 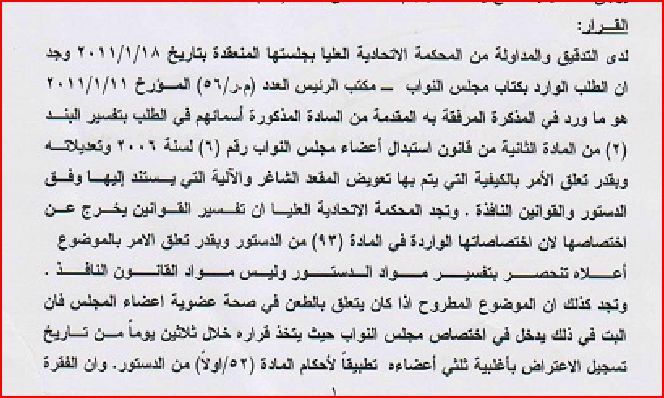 Thirdly, the timing is also interesting, since the request from Maliki’s lawyers to make the change is dated 2 December 2010, i.e. at a time when he had not yet had his new cabinet confirmed but evidently had the audacity to enter into such controversial legal territory apparently without any fear of creating scandal. But then again, this latest decision just adds to the impression of a political system that is rotten to the bone. Unlike the Tunisians, however, the Iraqis and the Iraqi press just don’t seem to have the guts to do anything about the situation. In a shameful and so far much-overlooked development, the Iraqi federal supreme court today issued a ruling to the effect that it has no jurisdiction in the question of the laws that govern replacement of candidates, leaving it to the politicians themselves to sort out the mess. This is nonsensical for two reasons. Firstly, in appealing to article 93 regarding its own remit and its supposed inability to touch on issues that relate to interpretation of laws in force (as opposed to constitutional interpretation), the court has shown great inconsistency over the past years. In fact, in one of its landmark rulings in July 2009, the court actually used its interpretation of the law on governorates not organised in a region to overrule the constitution itself regarding parliamentary oversight of the governorate assemblies. Secondly, and more importantly, the issue at hand is about far more than interpreting the replacement law on candidates from 2006. It is indeed about constitutional issues, since the principle of 1 deputy per 100,000 Iraqis is coming under threat when party leaderships dispose of replacement seats as they see fit and thereby upset the balance between governorates. The court also serves as a court of appeal in cases arising from the application of federal laws. At any rate, by referring to a clause in the constitution that establishes a procedure for parliament to make decisions regarding the status of its own members by a two-thirds majority (which in turn can lead to an appeal to the federal supreme court), the court kicks the can a little further down the road and envisages possible involvement at a later stage. But it is totally unnecessary for the court to be so timid about the issue. Iraq needs a functioning parliament now, but instead of deciding on heads of parliamentary committees and its own bylaws, the assembly today declared another holiday which will last until 30 January, after the Shiite religious holiday of Arbain. Those waiting for a budget, security ministers, vice presidents or strategic councils will probably need to wait much longer than that. It has been reported that 40 Kurdish deputies withdrew from today’s parliament meeting in protest against the revised version of the budget, now presented for its first official reading. What the Kurds protest against are the limited changes to the previous version. That was tentatively “read” in the parliament earlier, and the Kurds rightly protested that it had not been duly considered in the financial committee. However, even though the procedural objection of the Kurds was sustained and a provisional financial committee formed, the document that was presented today apparently still contained all the clauses to which the Kurds have made exception. Over and above that, the one major change appears to relate to additional funding for the next Arab summit to be held in Baghdad! Basically, the Kurds dislike the clause in the budget that obliges them to stick to an oil production target of 150,000 barrels per day. Or rather, they dislike the conditions attached to this item, i.e. firstly that any failure to produce that much will automatically reduce Kurdistan’s share of the national income from 17%, and secondly that the compensation for expenses that will be paid to foreign companies operating in Kurdistan has not been decided. In other words, there could in theory be a repeat of the stalemate seen in 2009 in which no agreement on the validity of the contracts signed by foreign companies operating in Kurdistan is reached – either because the Kurds refuse to submit the contracts to Baghdad for approval (which would signify an admission of a loss of sovereignty in the oil sector) or because the remuneration offered by Baghdad is seen as inadequate by the Kurds or their foreign partners. 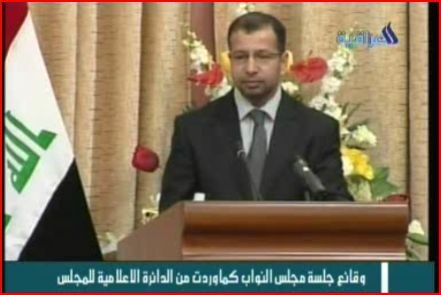 The underlying political dynamic that has enabled this situation to emerge consists firstly of the enduring centralistic tendencies in at least some leading personalities in Maliki’s entourage, and secondly the emergence of Iraqiyya as a potential supporter of these tendencies, for example through people like Rafi al-Eisawi whose finance ministry is directly involved in hammering out the budget. More dialogue is expected before a second reading and then the vote itself, perhaps in February. The problem for the Kurds is that Maliki does not need their votes to pass the budget (which he can do with the support of Iraqiyya alone), and unlike in 2010, the Kurdish president, Jalal Talabani does not have the power to veto it. During his visit to Baghdad over the weekend, the secretary-general of the Arab League, Amr Musa, has met with fake vice presidents and deputies who have stolen their seats in the Iraqi parliament. In this way, just like the rest of the international community, the Arab League is contributing to the further erosion of the Iraqi state at the time when it should have done the opposite. Today’s session in the Iraqi parliament just highlighted these unfortunate tendencies. With nauseating predictability, Musa was greeted by a procession of three speakers supposedly representing Shiite, Sunni and Kurdish interests, followed by a Christian. The only exceptions to the predictable pattern were the contributions from Tawafuq and Gorran, probably meant as consolation prizes for having been largely shut out of the recently-formed partial government. Salim al-Jibburi of Tawafuq, in particular, must have felt he was on borrowed time, since he recently, in an unconstitutional fashion, became the fourteenth member of parliament from Diyala, thereby snatching one seat from Salahaddin’s quota of 12. After the niceties had been completed, parliament also attended to some ordinary business. Abdallah Hasan Rashid al-Jibburi was sworn in as member of parliament for Iraqiyya to take the place of Salah Muzahim Darwish who recently became a minister. The change, which was constitutional since both were candidates for Iraqiyya in Diyala (though it is thought Muzahim was originally with Salih al-Mutlak whereas Jibburi has been reported as belonging to the Allawi faction), is interesting because the new member earlier got excluded from the seat he won with most votes in Diyala after Maliki’s State of Law in May 2010 complained that he had been previously convicted and hence unqualified to become a deputy. Possibly some more extrajudicial ad hoc reconciliation has been going on? The parliament also passed the law on a deputy or more for the president. No mention of the presidency council there, for sure. The law also confirms that the deputies have no other power than whatever the president himself delegates from his own, largely ceremonial prerogatives. We will still have to wait a little more before parliament confirms the maximum three deputies that the president can select, though it is widely expected that he will settle for Adel Abd al-Mahi of ISCI, Tareq al-Hashemi of Iraqiyya and Khudayr al-Khuzai of Daawa (Tanzim al-Iraq), with a Turkmen representative who ran on the National Alliance ticket today promising a “popular revolution” unless a Turkmen is given a seat! Alchemist of the revolution indeed. At a time when most of the Iraqi parliament is concerned with being Shiites, Sunnis, Kurds, minorites, and women, it is gratifying to find at least some positive exceptions. Gorran’s representative Latif al-Shaykh Mustafa recently pointed out that the alleged promise by Maliki to extend veto powers to the president as part of the Kurdish 19 points is in fact unconstitutional. (It should be added that there are absolutely no signs that Maliki has any intention to keep the promise, since there is no constitutional way for him to do so.) Similarly, Jawad Kazim al-Buzuni of Daawa (Tanzim al-Iraq) has attacked the intention of Talabani to create three presidential deputies, which he says is superfluous and a waste of government money since the presidency has no real power and responsibilities beyond ceremonial functions anyway. Maha al-Duri, a female Sadrist, has called for urgent decreases in the salaries of the “three presidents” (Maliki, Nujayfi, Talabani) and presumably their deputies also. Actions that challenge the muhasasa (quota) logic of the presidential deputies and the recent backroom deals on replacement deputies are welcome steps towards a more mature form of politics in Iraq. For now, though, the Iraqi parliament remains a council for self-proclaimed component representatives (majlis nawwab al-mukawwinat or مجلس نواب المكونات ) rather than a national parliament as such. The media is full of speculation about the return of Muqtada al-Sadr and what it means for Iraqi politics. The truth of the matter is we probably won’t know for some time yet. What is worse, though, is that whereas all the discussion of problems in Iraqi politics right now seems focused on Sadr and what it means for Iranian power in Iraq, the more gradual and less spectacular destruction of the Iraqi state in the name of a system of ethno-sectarian quota-sharing favoured by Iran continues on a daily basis. In other words, Iraqi politicians don’t need Sadr’s help in order to disassemble their own nation. They’re doing quite fine in that respect already. Take the lingering issue of the deputies of the president. Apparently some in the Iraqi media must have finally woken up and challenged the establishment, because on Monday there was a report that one Ismail Alwan, described as a “legal expert”, claimed the Iraqi president, Jalal Talabani, had issued a special “order” whereby his two previous deputies in the presidency council, Adel Abd al-Mahdi and Tareq al-Hashemi, had somehow been made “temporary deputies” for him. Sources in the offices of the two men confirmed the existence of this kind of “order”. Multiple questions arise out of this. Firstly, where exactly is the order? If it is somewhere on the presidency website then it must be carefully hidden, for the news section there is just full of the usual idle reports on Talabani’s endless travel and ceremonial exchanges of telegrams with foreign dignitaries. Second, if the order exists, how has Talabani acquired the right to create any deputies in the absence of a law for their election? Clearly, that is for the federal supreme court and not the president to decide. If the president has indeed issued this kind of order (and he has been innovative in this respect in the past) he should be challenged to present it to the public with a reference to the legal rationale for this course of action, because it is far from obvious that he has the right to make this kind of appointment. What this all goes back to is the continued failure of much of the Iraqi media to appreciate the radical difference between the relatively weak presidency now in force and the relatively strong presidency council that was a transitional arrangement for the first parliamentary cycle from 2005 to 2010 only. The latter does not exist anymore and cannot be revived except after a referendum; it goes without saying that Talabani’s deputies in the presidency council cannot follow him into the presidency: The two offices have completely different sets of prerogatives and have no relationship to each other. The soon-to-be-adopted draft law on the “deputies of the president” also confirms this state of affairs. 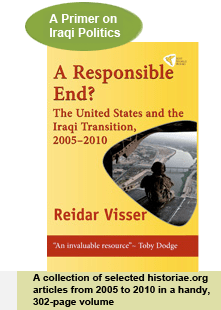 The case of the deputies of the president and the way it gets overshadowed by Muqtada al-Sadr just underlines how Iran’s sophisticated strategy of achieving influence in Iraq is succeeding thanks to American misreadings of what that strategy is. Alarm clocks appear to go off in Washington whenever there is mention of Muqtada; however Iran’s more basic strategy of keeping the Iraqis preoccupied with the game of ethno-sectarian quotas is promoted and even celebrated by the Americans. It should be a hint to Washington that Muqtada is not the sole VIP traveller between Iraq and Iran right now: This week also sees visits to Iraq by the Iranian foreign ministers and Kurdish leaders plus Ibrahim al-Jaafari of the Shiite alliance going to Iran. The key question going forward is more than what Sadr will do. Rather it is about whether the new government can stop thinking about silly quotas, dozens of useless deputy president positions and made-up interpretations of the constitution aimed at perpetuating the system of sinecures, and instead build a strong and coherent government capable of confronting whatever cards Muqtada may have up his sleeve.